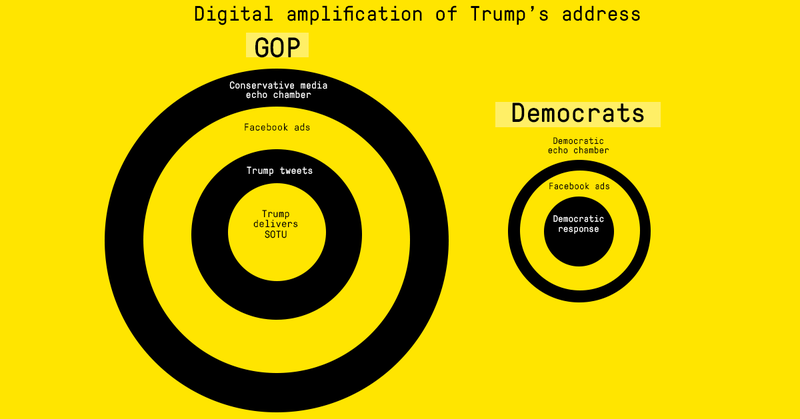 This week, as Donald Trump delivered his second State of the Union Address to the nation, we took a look at how his campaign and conservative allies leveraged digital channels and investment to amplify and prolong Trump’s message…and how that compared to efforts on the left to drive their own counter narrative around #SOTU19. 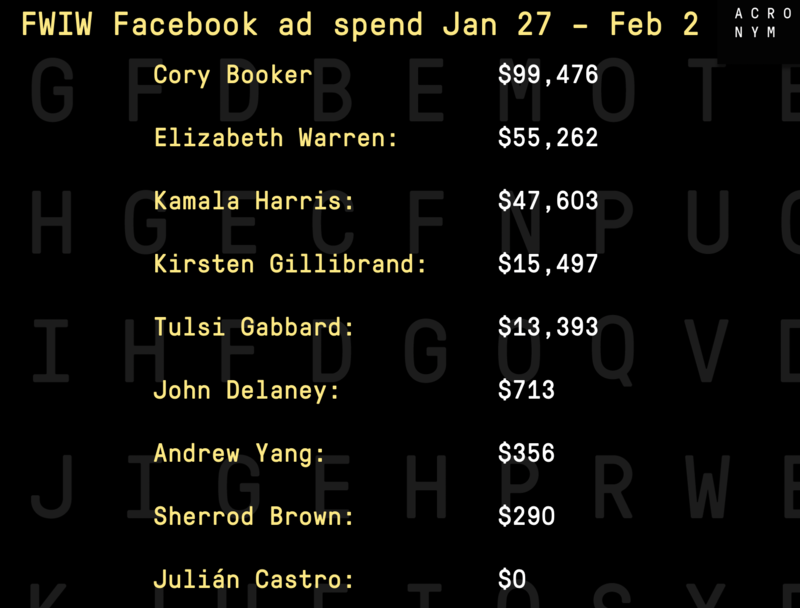 Here’s a list of the top political spenders on Facebook the week of January 27 – February 2 and the causes they’re advocating for. Trump’s campaign resurfaces as the top spender of the week after trailing briefly behind Kamala Harris and Tom Steyer. Among the Democratic presidential contenders, Cory Booker outspent the rest of the field last week, spending just shy of $100K for his 2020 campaign launch. *UPDATE: Last week, we mentioned we couldn’t find any Google spending info on Kamala Harris. Thanks to a loyal reader, we found that she spent approximately $100K on Google during the first week of her campaign. 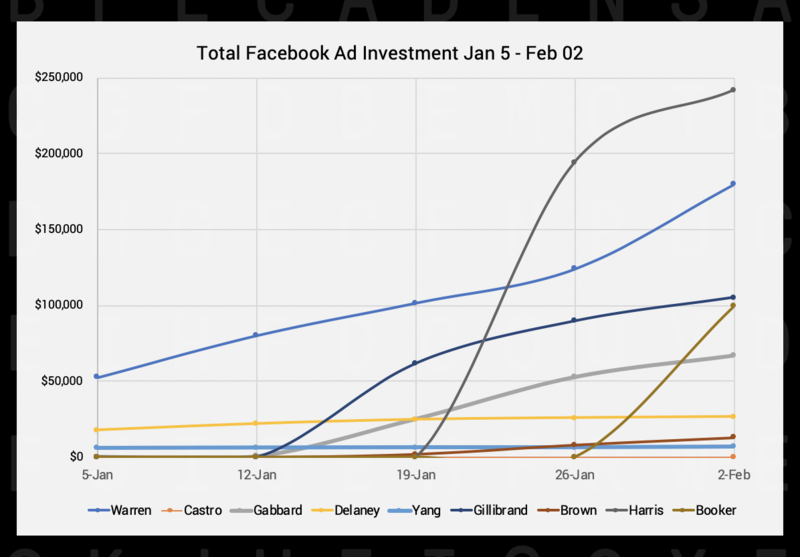 A few of you asked us to track Trump’s digital ad investment over time – so here it is! 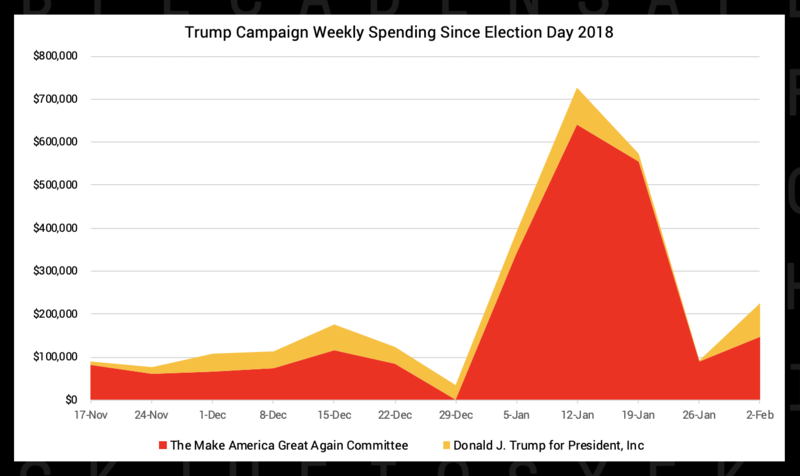 Below is a graph showing the Trump reelection campaign’s spending on Facebook ads since November 2018 (through both the Make America Great Again Committee and the Donald J. Trump for President, Inc. accounts). 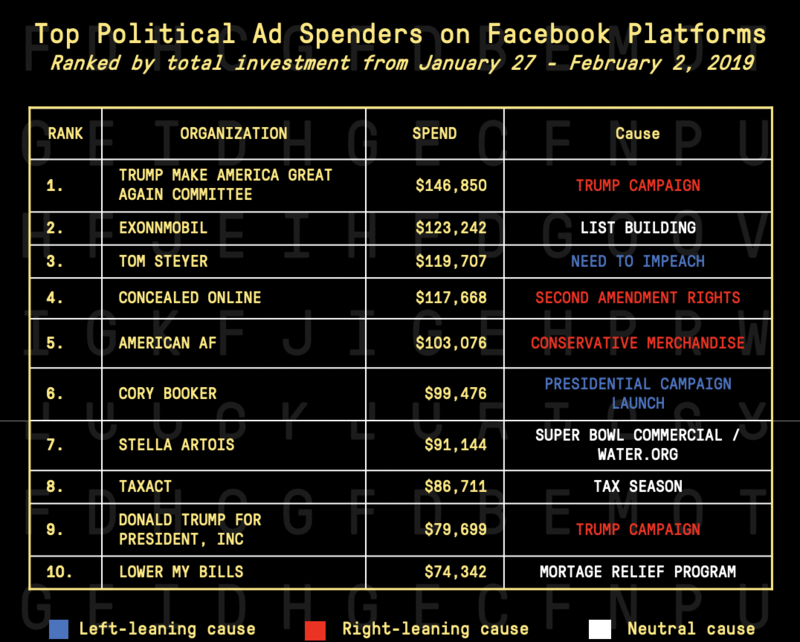 Through both organizations, the Trump campaign has already spent nearly $2.73 million on Facebook for the 2020 cycle. 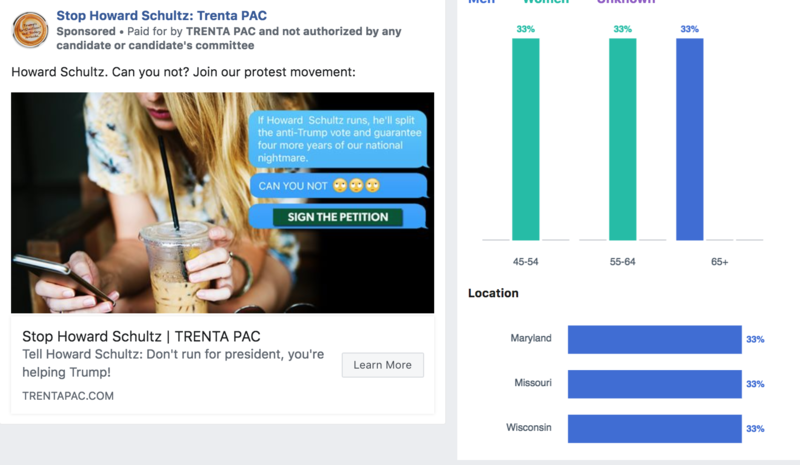 We’ve talked a lot in FWIW about how Donald Trump’s campaign and conservative media properties have consistently invested in spreading narratives across the country through digital advertising. This week, we used the State of the Union as an example of how that happens in practice – and what Democrats are doing on the other side. Trump campaign offering names to appear on the campaign’s livestream screen during the speech in return for campaign contributions. 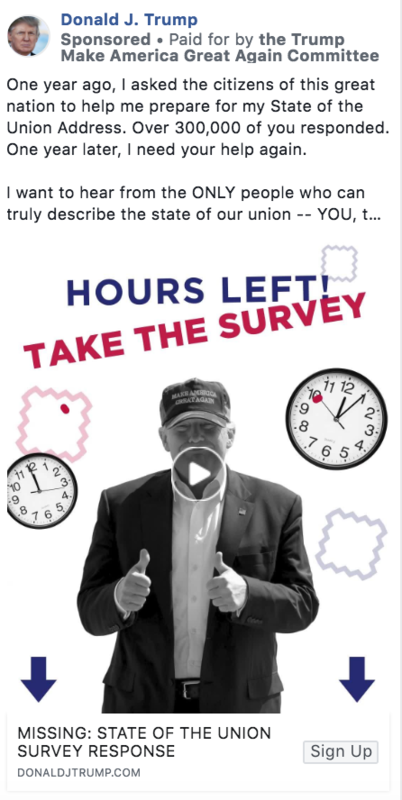 Trump organization using survey ads to build list and gain data about voter sentiment. Interestingly, the survey asked respondents over 30 questions before asking for their contact info 🤔. Trump also had help building up enthusiasm and riling up his base from the conservative media echo chamber. 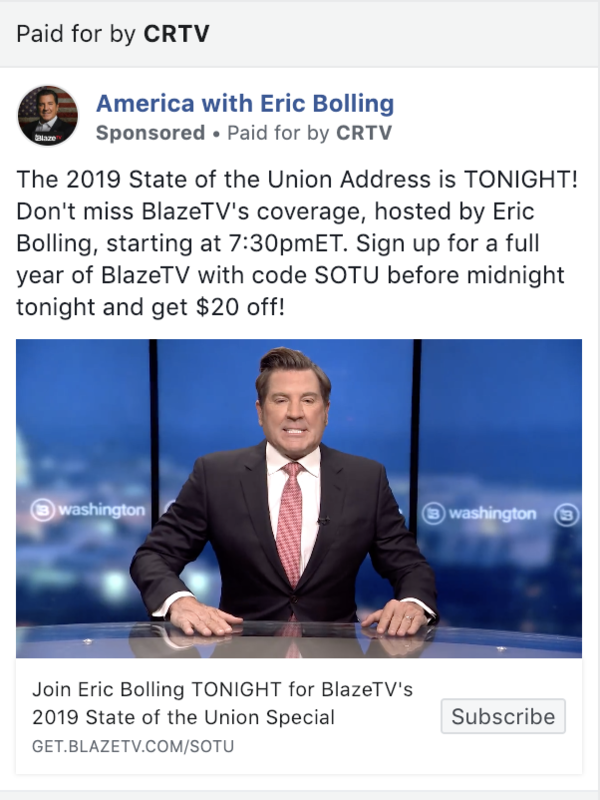 Organizations like Conservative Review TV, a frequent Facebook spender, ran dozens of ads leading up to the State of the Union encouraging viewers to watch their coverage of the speech rather than watching it through traditional media. 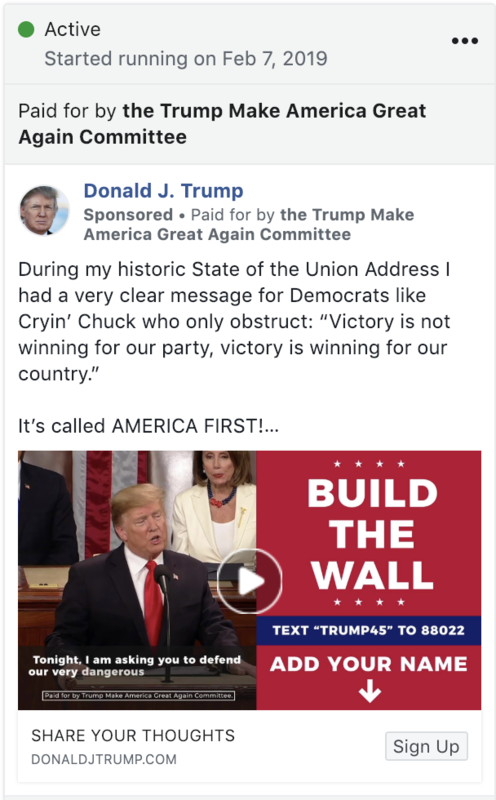 Democratic organizations were also running thousands of Facebook ads going into the State of the Union, but they were mostly focused on generic list-building rather than pushing specific (or coordinated) messages around the speech. 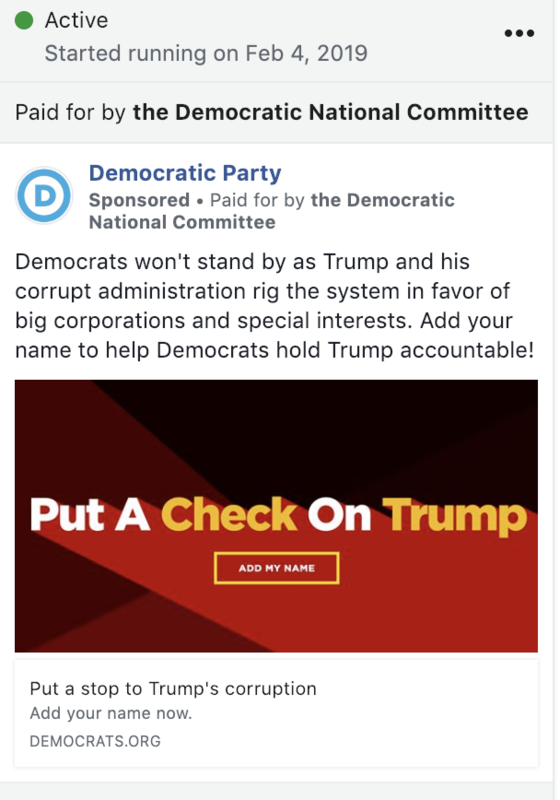 Here are a few from the DNC below, which ran over 1000 Facebook ads going into this week. 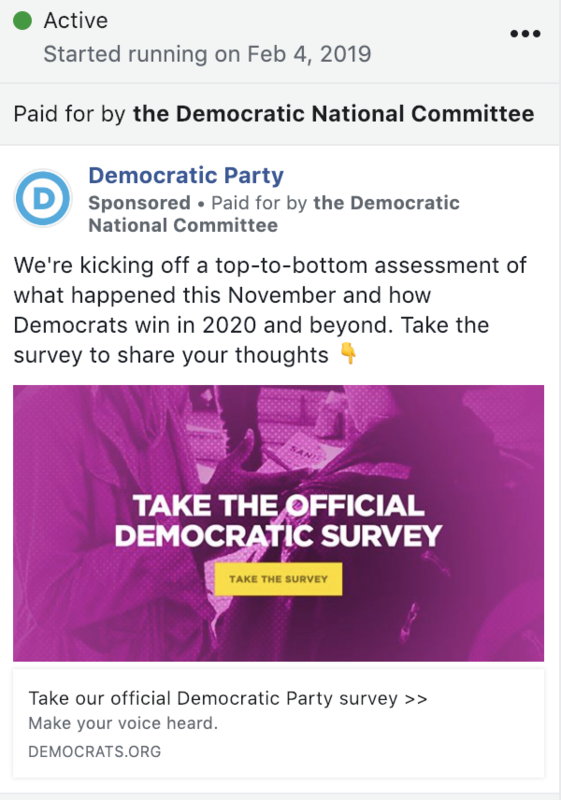 Interestingly, we didn’t see any SOTU messaging among the ads run by 2020 Democratic presidential candidates. 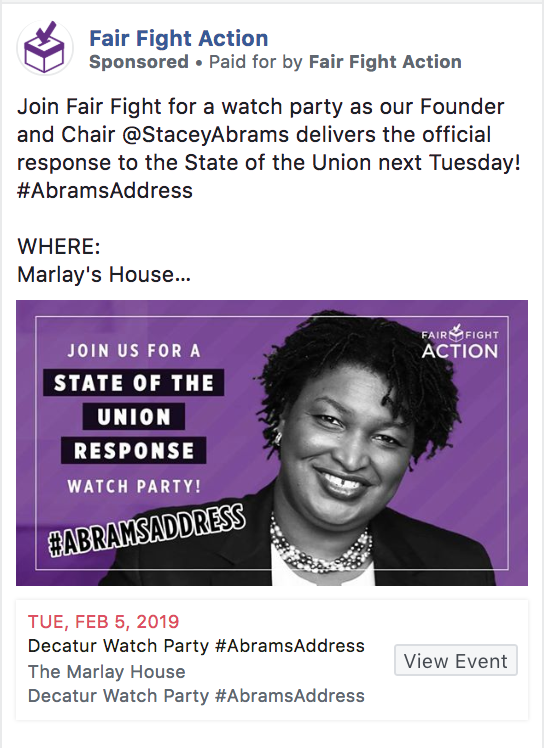 However, we did find dozens of ads run by Fair Fight Action promoting Stacey Abrams leading up to her delivering the Democratic response to the State of the Union. In the days after the State of the Union speech, both Republicans and Democrats leveraged paid media in hopes to further ingrain their intended narratives with voters across the country. 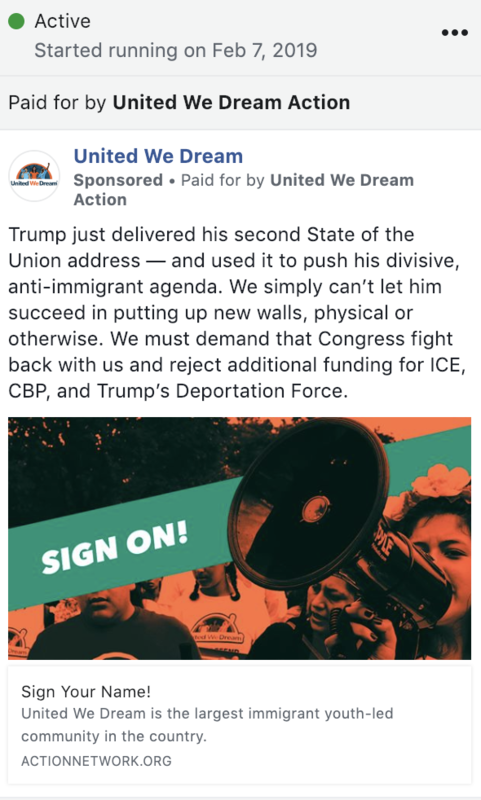 As of this morning, Trump’s campaign was running approximately 3,400 unique Facebook ads specifically mentioning the State of the Union, which include clips of Trump’s speech and the anti-immigration messages he drove during his remarks. 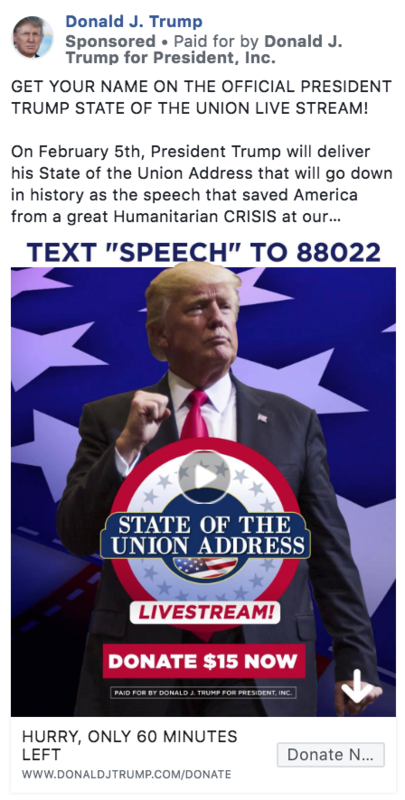 On the other hand, the Democratic organizations that have been communicating about the SOTU following the speech have been primarily organizations with specific policy-oriented missions. 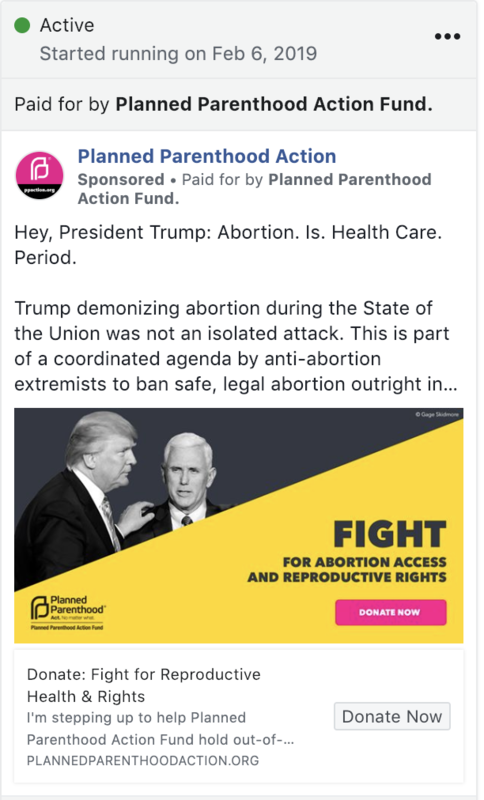 Organizations like Planned Parenthood and United We Dream are running ads addressing Trump’s attacks on women’s health and immigration head-on, but the major Democratic committees and 2020 candidates have yet to run ads with State of the Union related messaging. Overall, Trump’s campaign and his conservative allies used resources and coordinated messaging strategies to prime the American audience for Trump’s State of the Union Address and to ensure their message is consistent and continues to reach voters across the country even after the speech ended. This is just one example of how the GOP and Trump have built a powerful digital infrastructure that can be leveraged around any major event, campaign, or national controversy. You can read more from our CEO on this topic in an opinion piece published just yesterday here. TL;DR Democrats need to start seeing paid media not just as a tool to build lists or fundraise in a vacuum, but as a way to do that while also driving narratives that energize and mobilize voters across the country – because that’s what Trump is doing with his own base. 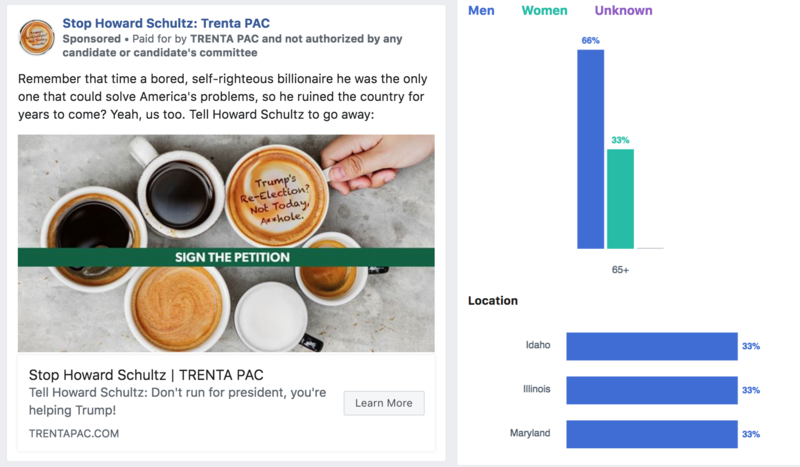 While we couldn’t find any ads running on any digital platform from Independent candidate Howard Schultz, we did come across these ads from Trenta PAC, a new political action committee opposing Schultz’ run. The targeting seems a bit odd, though 🤔. 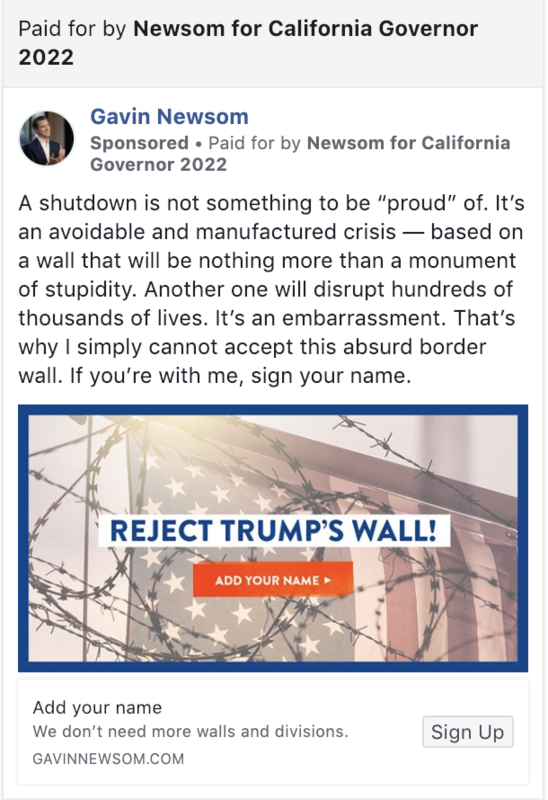 Our favorite California governor is back up with hundreds of list-building ads across California and nationally for his 2022 reelection campaign.